“Mini Blogathon” for those of lesser stamina. 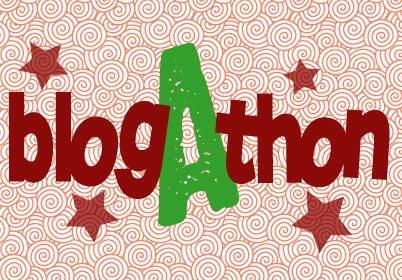 I can’t believe three weeks have passed by, since one of my very dear wordpressing friends tagged me for the blogathon. Aurora HSP is a beautiful, creative, brave and honest person, who fights valiantly for what is right and good in life. Thank you for tagging me, Aurora HSP, and for your wonderfully kind words. 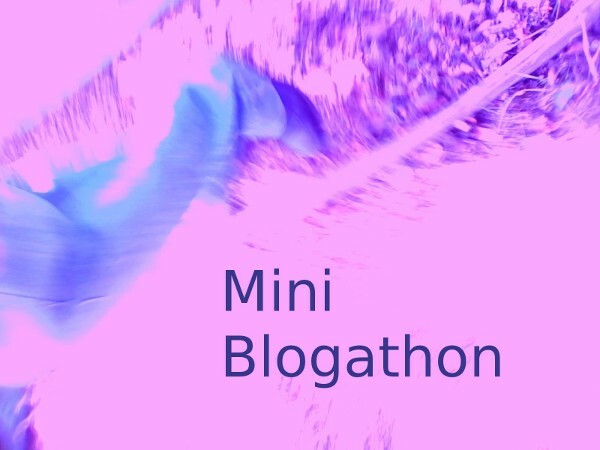 I hope you’ll forgive me for opting out of the full race and designing a mini version of the blogathon. 1. Each person tagged must post 5 things about themselves. 2. They must also answer the 5 questions the ‘tagger’ has set for them. 3. They must create 5 more questions to ask bloggers they have decided to tag. 4. They must then choose 5 bloggers and tag them in their post. 1. 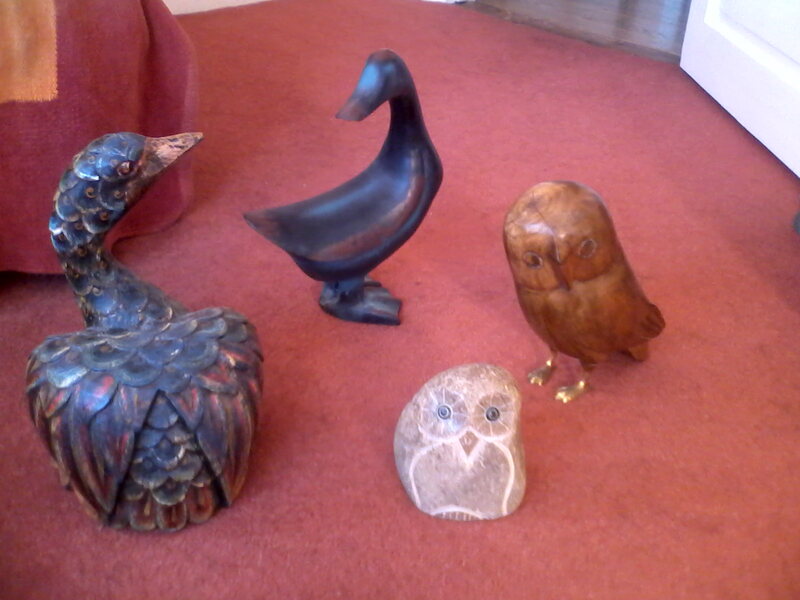 I collect ornaments of strange birds. 2. 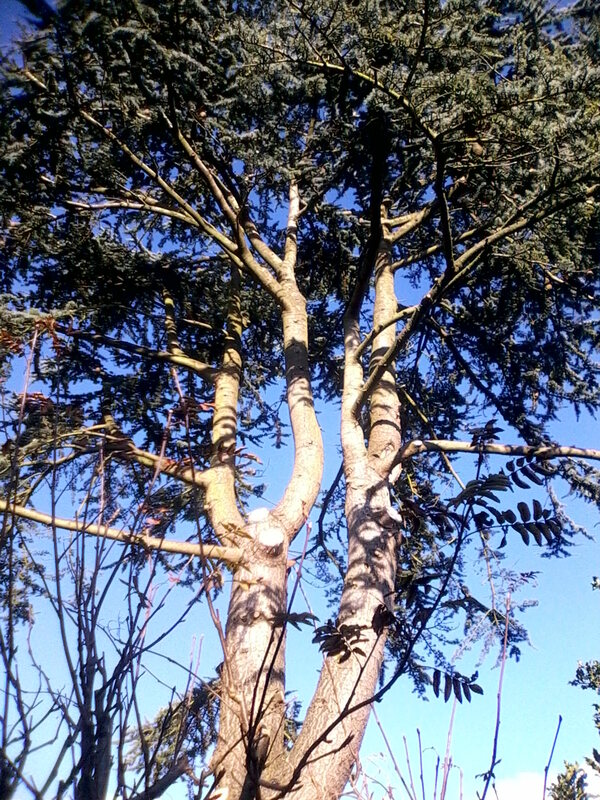 I love the impressive architecture of trees. 4. My favourite television drama of the year is ‘The Paradise’, which the BBC describes as “An intoxicating love story set in England’s first department store in the 1870s”. The story is based on the classic French novel Au Bonheur des Dames by Émile Zola. 5. I refuse to engage with the commercialism and materialism of Christmas–especially glittery decorations and false expectations of a magical outcome. Such can lead to family arguments, disappointment, debt, and even mental illness, as well as being an unacceptable drain on the world’s resources. 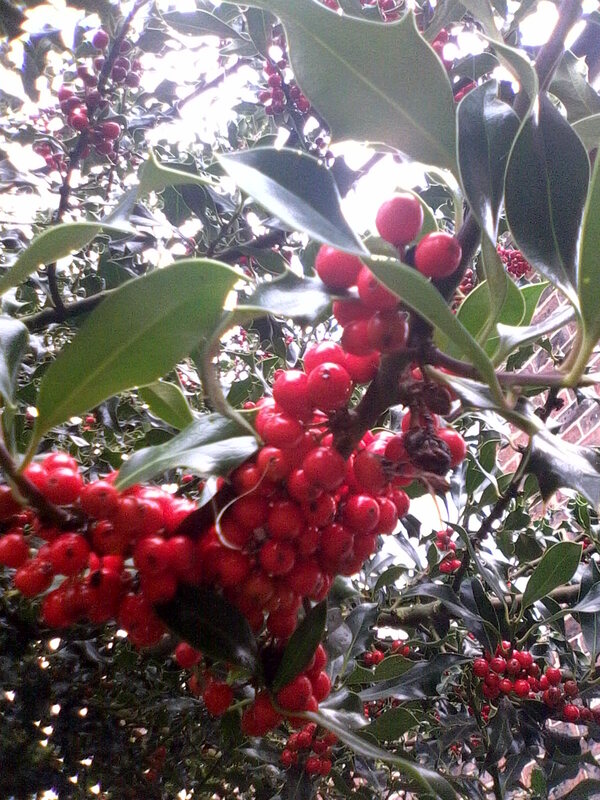 I would rather go outside and contemplate a holly tree. 1. All right, so you’re on a cloud up in the sky. You look down. What do you see? My feet being enveloped by cloud. 2. What is that one thing that triggers your admiration for someone? Unconditional positive regard for others. Creative engagement with people from around the World. 5. What is the song that you just can’t stop listening too at the moment? 6. How would you spend your very last day on Earth? 7. It’s my birthday. What gift do you send to me? War fuelled by ideological extremism. 10. Tell me what you eat for breakfast. Porridge oats made with goat’s milk and sprinkled with ground nuts. 11. And finally, give me a nickname! “Takchawee” — Sioux Indian for doe, in all her beauty and gentleness. 1. What’s your favourite opening sentence to a novel or short story? 2. Have you ever read a self-published novel, and enjoyed it? 3. What’s your favourite quote of all time? 4. When you look in the mirror, do you like what you see? 5. Do you believe extraterrestrials have visited our world? Tea with a Pirate at http://managuagunntoday.wordpress.com/ is an errant gypsy who roams the seven seas searching for a home to call his own. Gloria the Poet at http://lovelifeandpoetry.com/ is a hopeless romantic poet who can’t help but be in love. Patrick Latter at http://hikingphoto.com/ likes hiking and photography. Phil at http://up2randomthoughts.wordpress.com/ is master of the random and eccentric. Ralphie at http://ralphiesportal.me/ is the proprietor of a home to the zany and whacky dodo. On an earlier occasion, while fired up with exceptional mental energy, I did run the full blogathon. You can check this out by sprinting over to https://sarahpotterwrites.wordpress.com/2012/03/14/tagged/. If any of my five taggees of today would rather go for the long haul, please feel free to answer the eleven questions I asked of my “victims “on that earlier occasion. Of course, there is no obligation to take part in either the blogathon or the mini blogathon, but, if you do, I would very much appreciate you copying and pasting the relevant emblem into your post. You made me smile – a lot, but you also are bringing a lot into my life – its just true – I liked the goat’s milk touch, and agree with the crassness of Christmas. Will tackle the tasks with relish. Thanks! Goat’s milk is much better for the clarity of my singing voice than cow’s milk. Fortunately, I really like the taste of it, too. Yes, better all around I think. When I lived in Saudi Arabia I used to drink fresh unpasteurised camel milk while sitting in the desert with Bedouins. Nothing can beat that. Since then I can’t even look at wine or anything else than water, tea or coffee. My brother used to be in charge of the camel house at Windsor Safari Park. Camels have an incredible amount of personality, although I’m not at all happy about such wondrous beasts being kept in captivity. How many countries have you lived in? Or perhaps I should ask, how many countries haven’t you lived in? Yes, and camels have memory too! They actually do plot revenge! I know, its funny you say that – people often seem to. I do like to tell a story about things that have happened, and they have tended to happen off the beaten track, so the background is more vivid – I mean I really avoid everywhere too visited or worked in, which leaves just a few! Some countries in Europe, some in Central America and some in the Middle East, and that’s it! How long has the tag been going? Thank you for tagging me. Due to my ‘special’ circumstances though, you’ll have to bear with me, for it might take me a while to get everything together. Hugs from Ralphie. No pressure to hurry. As you can see,I wasn’t exactly super-sprinter of the year in picking up the tagging baton from AuroraHSP! Hugs to you, too, Ralphie. Sorry I’ve been slow acknowledging your kindness, but have been kept from my computer since Saturday by life’s exigencies. I’m trying desperately to find time to write another NWW post, too.